i’m currently one of those full-time workers trying to juggle uni. as a result, i find myself most weeks taking a couple of hours out one morning to catch-up on studying or assignments. don’t get me wrong, this usually means i’m still in the office at 8 or 9pm that night, but i function better in the morning… and any excuse for brunch right?! one of my favourite study/uni spots is chez dre in south melbourne. tucked up in a little laneway, finding a table during the week is a breeze. be prepared for a wait on the weekends though. 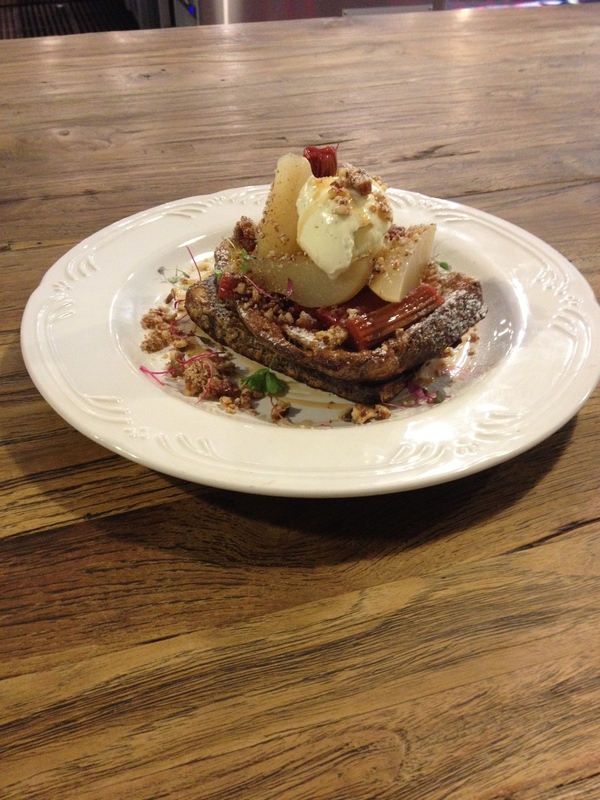 i ordered this irresistible french toast last week and couldn’t get enough. its true i’m a sweet tooth, but this particular dish has the perfect balance. not drowned in maple syrup and the rhubarb creates an excellent contrast to the crunchy candied nuts and sweet pear. stay tuned for more delicious offerings from chez dre coming up. and don’t forget to take a pastry (or three) with you on the way out.